Dawn Williams’s New Book “No Mercy” is a Steamy Tale of Mysterious Assassins and Dramatic Rescues Set in the Lavish High Society of England. Recent release “No Mercy” from Page Publishing author Dawn Williams is breathtaking thrill ride into the life of the King’s most secret of weapons, a beautiful, but deadly secret female assassin. 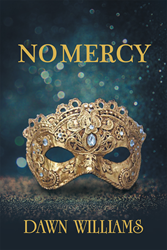 Dawn Williams, a member of the Romance Writers of America, has completed her new book “No Mercy”: a lavish and romantic tale full of intrigue, murder, and passion. Published by New York City-based Page Publishing, Dawn Williams’s vivid and detailed story is of the beautiful but deadly assassin, Serenah Salvatori. Her job is to dispose of individuals whom society deems to be a dark curse upon its people and she does so with brutal efficiency. However, when such a mission goes horribly wrong and she is captured, the king sends Damon Wessex, commander of the Royal Black Guard, on a treacherous assignment to infiltrate France’s notorious Clairvaux Prison. Damon is to free her before her relationship to the king is exposed and she is executed. Without the king’s permission, Serenah embarks on a dangerous mission to England on behalf of a victim of a malicious crime lord who has penetrated London’s underground. She attends a masquerade ball to lure him to his death, however, soon discovers her mission compromised. Undeterred, she wages a war against England’s untouchable, high society while Damon is one-step behind her unraveling her closely guarded secrets and determined to protect her. Readers who wish to experience this exciting work can purchase“No Mercy” at bookstores everywhere, or online at the Apple iTunes store, Amazon, Google Play or Barnes and Noble.